Minnie Mouse Cupcakes info about the game-Games2Rule. We have a great new dessert recipe for you, which I am sure you will adore. This great recipe is called Minnie Mouse Cupcakes and you will need many great ingredients to cook it. In Minnie Mouse Cupcakes you can make the ears from black fondant and cut it into round shapes. Place the two ears on each cupcake and then place a white bow to finish the decor. You can use white chocolate flakes as well. 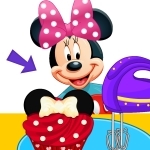 Enjoy the very fun cooking game called Minnie Mouse Cupcakes!